Moderator Lisa Haselton: Welcome to The Writer's Chatroom. Our mission is to present fun and educational chats for readers and writers. Let me introduce our guest, Shelley Armitage. Shelley grew up in the northwest Texas Panhandle in the small ranching and farming community of Vega, Texas, in Oldham County. She still owns and operates a family farm, 1,200 acres of native grass, wheat and milo farmland bordering Highway Interstate 40 on the south and the Canadian River breaks on the north. Shelley shared this landscape from childhood on, riding with her father and grandfather to check crops and cattle and later jogging and today walking the farm roads. Shelley’s professional life has offered her a connection with landscape through studies of photography, environmental literature, cultural and place studies. After living and working in diverse places—Portugal, Poland, Finland, and Hungary, teaching in the Southwest and Hawai’i, researching in New York, Washington DC, Oregon, Illinois, Missouri, Connecticut—place has taken on special meanings. The author of eight books and fifty articles and essays, Shelley has held Fulbright Chairs in Warsaw and Budapest, a Distinguished Senior Professorship in Cincinnati, and the Dorrance Roderick Professorship in El Paso as well as three National Endowment for the Humanities grants, a National Endowment for the Arts grant, and a Rockefeller grant. Shelley resides part of each year in Las Cruces, New Mexico. Ladies and Gentlemen, please welcome Shelley! Shelley Armitage: Thank you everyone. So great to be here. Chatter Tricia: Could you talk about how prominently you think a sense of place should figure in fiction? SA: I think it depends on the fiction. But I think place can be defined in many ways, even Proust's chair in a room. Often I think place is not a "setting," or a backdrop but something highly psychological, etc. Chatter Tricia: Fascinating, Shelley. Thank you. LH: Shelley, what is the Llano Estacado and why was it important to you to walk some of its many miles? SA: The Llano Estacado is a vast tableland (much of it at 4,000 feet) – an elevated plateau – one of the largest in the U.S. My modest part is in the northwest part of Texas near the New Mexico state line. I found it important to walk there in order to really sense the place, its prehistory, history, and the various stories, including the land's own narrative by actually feeling the place. I say in the book that I felt I took the land up in my body and it came out writing. Also, that area is much maligned, called by some still the Great American Desert, and stereotyped as flat and "unworthy of love." I found special beauty and surprising revelations by spending many summers walking there. LH: So you hadn't planned to write about it when you walked it? SA: No. At first this was a kind of recreation and honestly a habit of many years spent with my dad on the farmland. I had often jogged there and then later when I wore out my knees, walking. So out of sheer boredom one summer, I decided to start at the family farm and follow an intermittent creek some thirty miles to where it empties into the Canadian River north. My dad had known the earliest settler, Ysabel Gurule, in that Canadian Valley north from the farm and it turns out Ysabel's dugout (he came in l876) was at the end of that creek, connecting the farm to the river. I thought the two men's lives and narratives connected through the story I might discover from the land. Chatter Michael: What are some of the major themes you've dealt with in your books and articles? SA: Wow, that's a big one. I would say the theme of the forgotten, marginalized, disregarded, etc. I've always chosen subjects that I considered very key, very important but that may not be part of a given canon or centrist. 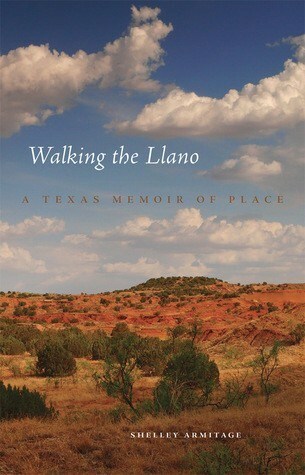 For example, the story of the llano. Most people have never heard of this geographic location much less the stories of Comanche and Kiowa, Clovis and Folsom man, etc, etc. I've written about cartoonists who has been forgotten yet who were key to defining the visual components of an era, for example. In my recent book, there is the theme of beauty redefined. Of a personal ecology, as I call it. Chatter Tricia: Is that where you've planted native grasses? SA: Yes, the native grasses have been restored. There was already some native grass, never plowed, there. It's very satisfying to hope that habitat restoration might make a difference. Chatter Tricia: That's wonderful, and it seems that habitat restoration would make a difference for sure. SA: It helps restore wildlife corridors, for example, for pronghorn antelope. But the book, Emerson like, takes the concrete, such as these ecological features we are discussing, and I hope makes them soar. Chatter Jim: Interesting about the replanting. Do you have a notion of the depth of the top soil there? I am trying to get an idea of the sort of grass there. SA: Depth of topsoil. Not sure really. But there is a healthy amount and dryland farming does very well there. It's actually easy to be ecologically smart there if one is patient. There is buffalo, side oats grama, little bluestem, etc. Chatter Jim: I've heard of bluestem. My thanks. SA: It's what folks call short grass prairie. LH: Do you remember a moment when you 'knew' you'd write the memoir? A day or when you noticed something in particular? SA: Actually, I had been teaching a memoir course, without having written a memoir! And yes, looking back on notes and photographs I took, I started thinking about what Mary Austin said one time: "it's the land that wants to be said." Someone else I had done scholarly work on, a poet, also said she wanted to be a tongue for the wilderness. LH: Ooh, I like that phrase "a tongue for the wilderness"
SA: I thought that memoir as a form was particularly suited for what I thought about the experiences: it may deal with interiority, but also with the explicit world, thus concrete experience, but also interior thoughts, even dreams, the spiritual, etc. LH: Shelley, what did you discover about yourself as you walked in relationship to the land where you grew up? SA: Oh, so many things. The walks were also a respite from the worries I had carrying for a declining mother and later dealing with her death (while this process was going on) and also the death of my brother. I essentially lost all my family while on these walks. I turned to the plains as a kind of family, believe it or not, something that gave me strength and wisdom. I did a lot of research after each walk and thus studied lifeways and beliefs of Native peoples, the care of the land by pastores (New Mexico sheepherders), etc. The stories are what help us along, as Leslie Silko has said, "we are nothing without the stories." Living these other stories, while making my own, was profound for me. In one passage, I say I want to be adopted by mother earth and father sky, which sounds very corny out of context, but as an adopted child, it resonated many ways. LH: Have you found poetry a way to express some of what you feel/experience? SA: Yes, absolutely. And the book we have been discussing has been reviewed over and over as "lyric." I think my interest in the poetic voice and imagination, in writing poetry, in cultivating that ear, is in the book. Also, this is a reason I like memoir: such freedom stylistically. My poetry also deals with "a habit of landscape," the idea that spending time in places gives us keys to understanding ourselves and others. Chatter Janet: Even your answers to our questions are lyrical, Shelley. LH: What were some of your challenges in writing the memoir? SA: Well, for one, I had never written this kind of nonfiction. My scholarly works I hope are very readable; I have always thought of myself as a writer (or someone who attempts to be) rather than an academician. So grace and saying through style have always been important. I had never written about myself until this memoir. And it's amazing how it went through so many stages. I wrote and rewrote it, through a few years. I think each time I got closer to it writing itself, a kind of flow that was natural. A real story. And I learned I could write in segments. That I didn't have to have a logical sequence. This was the most freeing discovery--this and the realization that memoir allows for fictional devices, so as I say I did not have to make everything logically sequential. LH: Thank you! Was it challenging to figure out what to include and what to leave out? SA: Oh, yes. Great question. At one point (and back to the question about the poetic) I clipped and posted up on my garage wall the poetic lines I could not part with. Yet, I didn't know exactly what to do with them. Then, looking at them on the wall (like Faulkner diagramming As I Lay Dying) I saw they were the subconscious underpinning of what I wanted to say. So I could build on them. That way, I could cull what didn't fit, didn't connect as extended metaphor or expanded imagistic theme. SA: I found it kind of tricky when you already are a critic, a literary professor, and come at literature from that perspective. To critique oneself, yet not gut what is a primal sort of notion, the given line, the lyric voice, was difficult. I found another self, the one I had always wanted as a writer, in this book as in the poetry. Chatter Jim: I was wondering about your overseas time and how that influenced your writing? SA: Yes, great question. I think the Fulbrights and other overseas teaching have been the pinnacle of my life. I was able to get out of myself, try to fit in, learn from other cultures. I first went to Ethiopia when I was young and a young teacher. That changed my life forever. I would always encourage anyone to travel and to witness. I loved it!! Chatter Janet: A reviewer of your memoir said "She carefully mines the history, character, and geology of the Llano Estacado and combines it with a compelling personal narrative to create an account that flows with lyricism, authenticity, and wisdom." You have crafted a beautiful story I believe. What period in your life is in the book? SA: The book, or I should say the experience of the walks, began in my fifties. That was a very transitional time for me; as I say, my mother had all sorts of health problems and I found myself the prime caregiver even though I lived 400 miles away. I think that experience (the combination of adventure and loss) really helped me grow. Chatter Tricia: You mentioned your mother's and brother's deaths. Do you talk about your grieving in the memoir? SA: Absolutely. I couple those experiences with the hikes, the walking. I don't know how to explain those chapters, but everything is interwoven, which becomes the heart of the book. I still grieve frankly when I reread passages of the book and am buoyed as well. The walks helped me cope and gave me strength. LH: Shelley - you mentioned you were teaching a memoir class before you wrote a memoir -- did your approach to the class change after you wrote the memoir? SA: Actually, I had taught the class previously, but then had a chance to participate in that class later as a guest (I had developed the course). At that time, I realized I hopefully understood much more about memoir!!! I think the one thing that most affected me was realizing how narrative is not sequential. I actually wrote almost flash pieces, sections, even some which were aided by prompts (or forced by prompts!!). But somehow there was a thread, a kind of subconscious reality, that, when I looked at the fragments, they could be worked together. LH: Thank you for sharing that. SA: I should give an example. There is the obvious element of water, of the lack of it, in the llano. The Ogallala Aquifer, one of the largest in the world, runs underneath, but is rapidly being depleted. So in terms of water I had a natural trope emerging. My mother actually died from water on the brain. At one point, thinking about her condition, I say "water will have its way." This has been set up in earlier chapters with my observations of the landscape where water has previously sculpted the geography. And there is also an earlier section about my father building a dam which didn't hold against the periodic rains. Water will have its way. LH: Shelley -- what length do you enjoy writing the most? Do you find a particular word count to feel 'natural'? SA: You know, recently I have done these blogs, maybe a page and a half, which are remarkably satisfying! But that scares me: can I write something longer anymore or am I being lazy. But with short pieces, I think you have the challenge of saying something interesting in a small space, really not having the luxury of expanding, yet creating memorable kernels. I usually write about twenty pages for a chapter. And am comfortable with that length. LH: What tips would you have for someone wanting to write a memoir? SA: Value your own story (stories). Examine your life and think about the seemingly small and insignificant things about it which are waiting for you to revisit. With memoir, we have a double memory, that of the first experience, trying to remember it, and that of recreating that experience. It's almost like revising oneself, perhaps we become a better self once written out. And I would say write, write, write then look at that writing as if it is someone else's. What have you learned from it? What is missing? What do you want to know? And, back to my two suggestions, what can be found there? What is remarkable about the seemingly pedestrian elements of our lives? And I forgot to say earlier that a major theme in the book is that we ARE the landscape. As Leslie Silko has said (sorry, but she is so right on in her comments), we are as much a part of the landscape as the boulders we stand on. In other words, landscape is not something "out there." But, maybe we could say, in here. LH: With your connection to your landscape and obvious passion for words, are there any writers, or poets, that come to mind for someone who wants to read beautiful and/or lyrical descriptions? 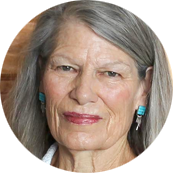 SA: The poetry of Peggy Church, a New Mexico writer, has inspired me. She's an older poet, that is, her style is totally lyric so may not be to the taste of some. I would read The Way to Rainy Mountain by Scott Momaday as a classic memoir that’s really an extended poem. Just freaking beautiful. Leslie Silko, a novelist. She is a key to understanding form itself. Oh gosh, I have tons, but hard to call them all up. Maybe I could send a list later!!! I think of the novelist Cristina Garcia who is a study in integrating very poetic lines with fictional narrative. Chatter Tricia: One that comes to my mind is "Lorna Doone." I know it's 'old', but it has some beautiful descriptions and places. It's as though the landscape is a major character in the story. I think that's true in much 18th- and 19th-century English literature, but perhaps in few books as much as this one. SA: Yes, so much of British literature of a certain generation is full of lyrical work. I tend to read so-called multi-cultural writers and contemporary work nowadays. LH: Do you write longhand, or on a computer? SA: I make notes in longhand, but have written either on a typewriter or a computer since junior high school, thank goodness. My dad brought home one of those little pink numbers from his work place and I was smitten. And believe me, junior high was a few years back!!! I remember when John Updike confessed he had to move from longhand in his writing practices to the computer. I think that must have been tough. LH: Thank you, Shelley. We're just about at the top of the hour, I can't believe how fast these 2 hours have gone. So I'll ask you for final comments... anything else you’d like to add before we close for today? SA: I want to thank everyone. How wonderful the questions and what a great experience. I am thrilled to have been here. Chatter Tricia: Is there a way to contact you on your website? SA: Yes, but also you can write me at ssarmitage@aol.com. Please do. Also, I would like to mention I do a weekly blog at shelleyarmitage.com. LH: Shelley has been an entertaining and informative guest with much to share with us. Check out her website after chat: http://shelleyarmitage.com/. Our Chatroom Team and I want to thank Shelley for an interesting and entertaining chat. Thank you!